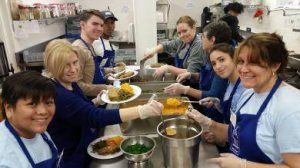 Partners for Health Foundation is launching the Third Annual Holiday Matching Grants program to benefit local soup kitchens, food pantries and organizations working to address the persistent issues of hunger and homelessness. Up to $225,000 in matching funds will be awarded for donations of $50 that are made by December 31. “The community was overwhelming supportive last year, when we received contributions of $202,700 from 438 individuals and families,” said Pam Scott, Executive Director of the Foundation. “These gifts were matched dollar for dollar by Partners for Health, resulting in grants totaling $405,400 that were distributed in Montclair to the Human Needs Food Pantry, Toni’s Kitchen, Salvation Army, HOMECorp, Interfaith Hospitality Network, and Montclair Emergency Services for the Homeless. St. Peter’s Haven Healthy Food Pantry & Family Shelter in Clifton also received a grant. The same organizations are participating in this year’s Matching Grants program. For more information, visit www.partnersfdn.org/HUNGER or call (973) 746-6130. Remember to fight hunger and homelessness by giving online on #GivingTuesday on November 29.